When you forgive yourself you become a positive example to others. Human beings sometimes like to roll around in and soak up negativity, believing we are unworthy of forgiveness. We have the tendency to turn ourselves into victims or martyrs rather than forgiving ourselves and moving on. “I forgive myself” is easier said than done. It turns out, everybody is worthy of forgiveness. You don’t have to earn it to purge something from your past. 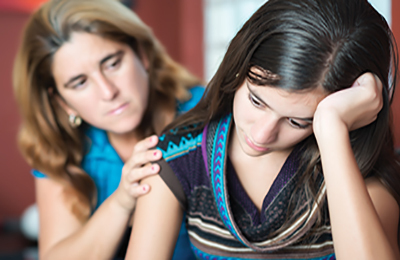 Students in recovery understand there are different components that factor into maintaining sobriety, including a spiritual support system. You can’t do recovery perfect or alone. Most of us have a spiritual anchor, someone we pray to. No matter what you call that source of power — God, love, the universe — this spiritual anchor assists in placing your focus on positive outcomes. When you focus on what you don’t want, you will get more of it — what you resist, persists. Ask yourself if this focus will lead you in a powerful, productive direction, or will it bring you down? Until you learn to accept a situation for what it is, it will continue to irritate you. When embracing a spiritual practice, for example with the thought that love is all there is, it becomes easier to be more compassionate with yourself, and to forgive yourself. The practice of forgiveness is a muscle you must continue to flex. “It is a constant practice,” Pryor adds. Pryor says when working with people in recovery or who are either adult children of alcoholics or come from a place where addiction was prevalent, a consistent theme is the need to self-sabotage. To play that same pattern over and over again. This pattern is not geared toward success but rather geared toward survival or just getting by. “When something bad happens to us, the brain goes into a fight or flight mode, and we have to make a decision about how we are going to survive it,” Pryor says. “The brain plays the situation over again anytime we are faced with a similar situation.” The brain will continue to loop the scenario until whatever happened in the past has healed or there is awareness that a different choice can be made. Before you are really able to serve others powerfully, it is necessary to arrive at a place of forgiveness first. Pryor points out that we are only able to love other people as we love ourselves. When we do, we have the energy to serve others. It is a muscle to flex, speaking to yourself in a kind and supportive way. “It is like creating a new relationship with yourself,” Pryor says. It truly is a journey, not a destination. As human beings, there will always be new “stuff” that comes up. “As long as you are focused on progress, whatever progress you make, you have no idea the difference you can make to other people,” Pryor says. He is amazed at the things people have done when they stay the course and move down the path of recovery. They really do make a difference to other people and they know they are worthy of self-forgiveness. 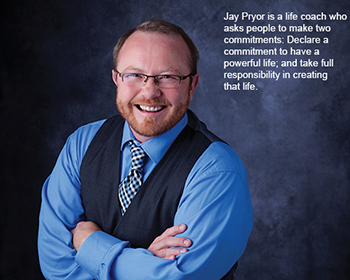 Jay Pryor owns Jay Pryor Coaching, based in Lawrence, Kan. Through his coaching practice, he helps individuals wake up to a vision of abundance and purpose. To learn more, visit jaypryorcoaching.com. Source: Compiled from a video on fear posted on November 13, 2013, at Jay Pryor Coaching’s YouTube Channel.